TITUSVILLE, Florida -- The Republican Club of North Brevard hosted a debate between current Brevard County Clerk of Court Mitch Needelman and former Brevard County Clerk of Court Scott Ellis on April 17, 2012 at 7:00 p.m. at the La Cita Country Club located at 777 Country Club Drive, Titusville, Florida. 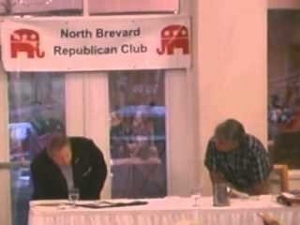 There will be another Brevard County Clerk of Court debate hosted by the Melbourne Area Federated Republican Women’s Club on May 2, 2012 at 11:00 a.m. at the Holiday Inn located at 8298 North Wickham Road, Melbourne, Florida. RSVP is required for this debate by April 27, 2012. Call (321) 727-1212.